Arrive at Ben Gurion Airport. After immigration, leave for Haifa via the city of Caesarea. Haifa is Israel's largest port city, which is built on the slopes of Mt. Carmel. 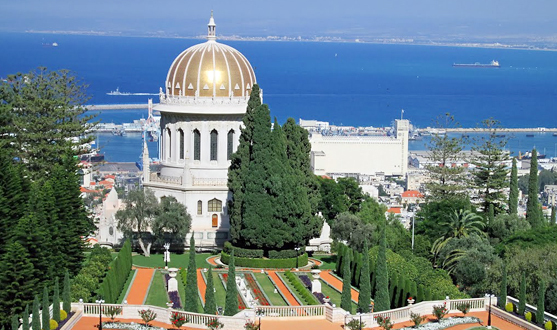 If time permits visit the famous Persian Hanging Gardens for a view of the Bahai Shrine. Then continue to Muhraqa, the place of sacrifice and the site where Prophet Elijah defeated the False Prophets of Ba'al. Your tour ends in Tiberias, nestled on the Sea of Galilee where Jesus performed many miracles. Dinner and overnight at your hotel. In the morning visit Cana where Jesus performed his first Miracle, changing water into wine at the wedding feast. Then drive to Nazareth, the boyhood town of Jesus and home of Mary and Joseph. Visit the Basilica of the Annunciation built over the grotto where Archangel Gabriel appeared to announce that she would bear a son, Jesus. Also stop by Joseph's workshop. In the afternoon drive through the landscapes of Galilee and later enjoy a ride in a replica of a Galilean fishing boat, on the Sea of Galilee where Jesus calmed the storm and walked on the water. Visit Capernaum, Tabgha and the Church of the Beatitudes. Make a brief stop at St. Peter's house, the Church of Primacy of Peter and the place where Jesus bestowed St.Peter with his authority. This is believed to be the place where Jesus dined with his disciples. The flat rock known as Mensa Christ of Christ's table commemorates this event. Return to Galilee for dinner and overnight. Today you will leave Galilee via the Jordan Valley. Stop at Yardenit on the Jordan River, the traditional baptismal site, and then drive along the Jordan Valley where you stop and view Mount Qarantal via Jericho, believed from carbon tests to be the oldest city. It is also the place where Jesus stopped on his way to Jerusalem on the Eve of the Passover and where Jesus cured the blind man during his stay at Zachaeus house. Visit Qumran Caves, where the Dead Sea Scrolls were found. Descend to the Dead Sea, the lowest point on earth (1305 ft. below sea level), to make a brief stop at a private beach and take the opportunity to float in the salty buoyant water, rich in minerals. Check in, dinner and overnight at hotel in Bethlehem /Jerusalem. Visit Ein Karem - the city of Judah and birthplace of John the Baptist, son of Elizabeth & Zechariah and the Church of Visitation. Then visit Mt Zion the cynical, the room for the last supper and dome of King David. Also visit the church of St. Peter Gallicantu which symbolizes Peter's denial of Jesus as prophesied at the last supper, and the church of Dormition. Then on to Bethlehem, which is located in the Judah province. It was here that the Angel announced the birth of Jesus to the Shepherds of Bethlehem during the reign of King Herod. Also, here David tended his flocks until he was anointed King of Israel. Visit Manger Square, the Shepherds Field, Crusaders Cloister Grotto of St Jerome. Return to your hotel for dinner and overnight in Bethlehem/Jerusalem. Visit Yad Vashem, tour the Menorah near the Israeli Parliament. Then visit the Mt of Olives to the Church of Ascension, which commemorates the ascent of Jesus to heaven, the Paternoster Church, where, according to tradition, lies the cave where Jesus brought his disciples and spoke to them about the mystery of the end. Then continue to the panoramic view of Mt. of Olives and from there, by foot to Dominos Flavit where Jesus wept over the imminent destruction of Jerusalem. The chapels are built in the shape of a tear as a poignant reminder to this event. Visit the Garden of Gat Shmanim where Jesus prayed while Judah betrayed him to the Romans. Visit the basilica of Agony. Return to your hotel for dinner and overnight in Bethlehem/Jerusalem. Start the day by going to the pools of Beit Hasda, where Jesus held the crippled man. And from there take the Via Dolorosa (Way of Grief), traditionally accepted as the last route trodden by Jesus. Follow the 14 Stations of the Cross to Golgotha, the place where Jesus was crucified marking significant events along the route. You will see Pilate's Judgments Hall, the Chapel of the Flagellation where, according to tradition, the Roman soldiers scourged Jesus and placed a crown of thorns on His head the Ecce Homo Arch. The last 5 Stations of the Cross are inside the Church of the Holy Sepulcher, visible from a distance, with its two silver domes. Also "The Tomb" widely believed to be part of the stone that covered Jesus's Tomb. Dinner and overnight in Bethlehem/Jerusalem. After breakfast visit the Armenian quarter and go through the Jewish quarter to the Wailing Wall, which is the holiest place for the Jewish religion. You will then be transferred to Jaffa (Joppa), to see the house of Simon the Tanner and visit St. Peter's Church (if time permits) after which you will be transferred to Ben Gurion airport for your flight back home. This is not the final itinerary and the sequence of the program may be changed depending on the security situation, flight details and as per the guide. Holy Land Pilgrimage with Jordan and Egypt. Holy Land Pilgrimage Israel with Jordan.